If your looking for the ultimate dance floor, this is definately one of them. Using a remote control with this floor adds that element of surprise for your guests. Your walking onto the dance floor for your first dance and hey presto the LED’s start twinkling on the floor and now sync this with our LED Tables and the whole room comes alive. Now that is magical. The intelligent locking system ensures that the dance floor will not come apart during use and with the fitting on the small ramp around the dance floor this makes it totally accessible for every guest. Typical sizes for dance floors are 16 x 16ft and can accommodate 60/65 guests. (Total guest number 120-140) We use 50% of your total evening guest numbers to work out the correct size floor required. Floors are primarily laid in squares and rectangular shapes can also be built. Thinking of adding some LED Uplighting? 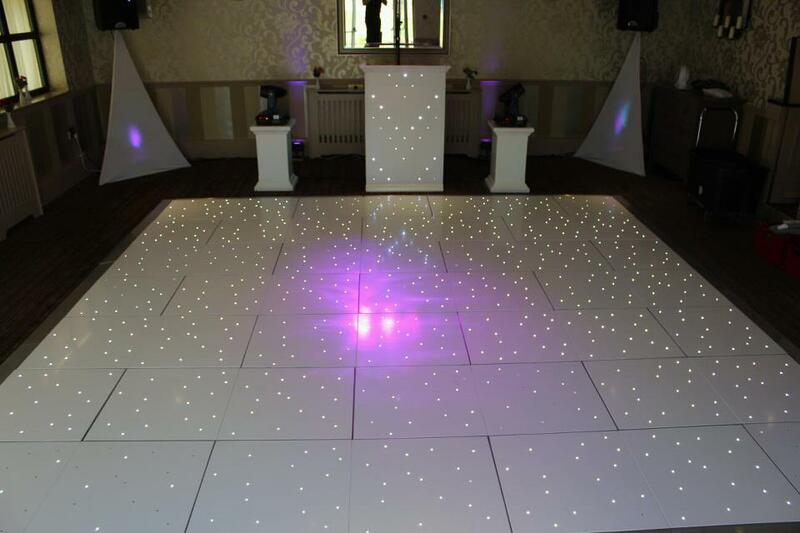 White LED Starlights Dance Floors are available throughout the UK including Derby, Burton on Trent, Stoke on Trent, Nottingham, Leicester, Manchester, Liverpool, Chetser, Preston, Blackpool, Carlisle, Newcastle upon Tyne, Durham, Middlesborough, Leeds, Bradford, Wakefield, Glasgow, Edinburgh, Scotland, Inverness, Kettering, Northanmpton, Milton Keynes, Coventry, Rugby, Luton, Hemel Hempstead, Welwyn, Hammersmith, Totenham, Wembley, Kent, Essex, Brighton, Portsmouth, Bournemouth, Swansea.